My sanseveria plant, aka Mother-in-Law-Tongue, is blooming. I’ve never seen one do this before, and it’s fairly amazing. 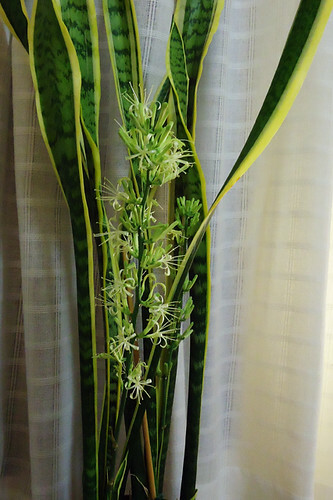 Wikipedia reports that this could happen every 2-4 years especially if the plant is root-bound (guess I better find a bigger home for mine when it is done flowering) but other sources online say it happens much less often. I was feeding all my houseplants leftover African Violet food; I wonder if that batch of nutrients induced the bloom? At any rate, I’m enjoying this once in a lifetime experience. To see the blooming process close up, watch the move below – someone used time lapse photography to capture it all.